One aspect of advising hobbyists has gotten easier the past year and that relates to fertilizer. When a question relating to fertilizer comes from someone with just a few plants my recommendation to them is to purchase a small bag of Nutricote from Carter & Holmes or the same product sold by Home Depo under the trade name Dynamite (13-13-13 with minors). This product is timed to last six months, but in orchids, which are watered less frequently, it really lasts for a whole year. An application of Nutricote in late winter or early spring provides an even dose of fertilizer, including the minor elements. Most time-release fertilizers cannot make this claim. By the time the release rate declines, the growing season is over. Nutrients accumulate in the medium over this time, but do not seem to reach toxic levels if pots are being soaked properly each time you water. 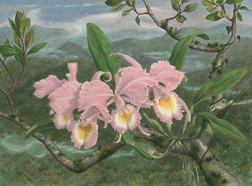 In winter, many orchids, such as Cattleyas, prefer to be drier and fertilizer is typically withheld until the plant begins a new growth cycle. Vandas and phalaenopsis grow continuously, although their growth is limited by lower temperature and less light. My experiments with these groups and Nutricote have not gone on long enough to advise on whether to use a second dose after six months. In my greenhouse, phalaenopsis and vandas are watered more frequently and hanging baskets every sunny day. The Nutricote may be exhausted after six months with frequent watering. Nutricote does not stay in baskets or in pots with very course media. It seemed that small pieces of fiberglass screen in baskets would keep the small gray pellets from washing out, but it did not. Embedding the fertilizer pellets in small clumps of osmunda fiber worked well and vanda roots quickly found their way into the mass of fiber and fertilizer. Despite direct contact with the Nutricote pellets there was no burn or damage to the roots. My latest trick was to place a teaspoon of the pellets in “Polyester Fibers”. (Fiberfill is the brand name I use.) Tie the stuff around the vanda stem immediately under the lower leaves. This allows the fertilizer to leach out during each morning’s watering and flow down the stem and onto roots. The experiment was done on a nearly dead vanda and the results were amazing. It is growing better than ever. The only problem with the Polyester fiber is that it is white and ugly. Fortunately, within a month algae begin to grow all through the material. It is still ugly, but at least it is green. How much Nutricote should you use on orchids? So far, I have not found a dosage that causes problems to roots. In fact, one plant purchased from a nursery that used the product contained at least one cup in a 6” pot. It was obviously spilled as most plants from the same nursery had a teaspoon or so. As soon as I realized how much was in the pot the plant was removed and the expectation was that all the roots were dead. They were not. In fact, the roots imbedded in and below the product were large and white. The plant was a Cattleya species with 7 pseudobulbs and was in the process of producing 6 new leads. As with all new products, begin with low doses. In my first year, I used ¼ teaspoon of Nutricote in each five or six pot. Last spring, I increased the dose to ½ teaspoon and noticed only positive effects on plants. After the end of the spring growing season both Phalaenopsis and Paphiopedilums will have completed a whole year using Nutricote and the results reported in this column. If these genera bloom as well as they are growing, my expectation is that it will be recommended as well. Authors’ Note: No compensation or free products have been offered or supplied by the makers of Nutricote or Dynamite (shucks) for the endorsement of their product.